Last year I made a Mini Basket Purse for a little friend of mine. This year she requested a much bigger bag for her present. As I was only given a few days notice it wasn’t going to be possible to make her a big bag so I decided to go with the tried and tested (and no thinking required) Pencil Case. This is what she received. After making a few different flowers and not liking any of them, I decide to check in my UFO wardrobe and came across this flower I made not so long ago. I added a button to the middle to complete the look. Once again though, I think I liked it a little more then she did! I really do like this colour combination, using four colours instead of three. This made the case slightly bigger then the three colour ones listed in my Pencil Case Tutorial. Also I usually line my pencil cases with nice fabric, I didn’t with this one. When I was crocheting I made sure I carried the yarn up instead of cutting at the end of each row. This required far less weaving in of ends and left the inside very neat. As always, if anyone wants to make this style pencil case, a picture tutorial can be found at the Picture Tutorial Post. 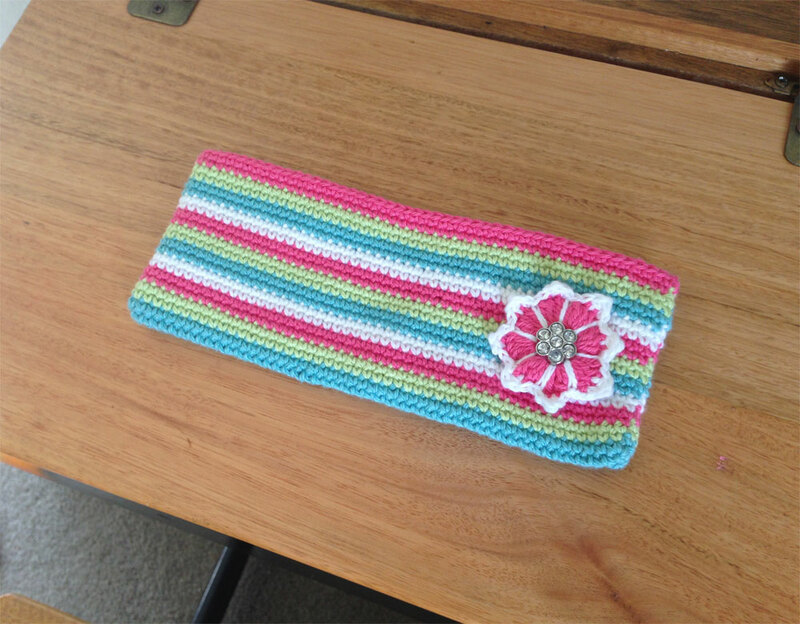 This entry was posted in Crochet and tagged Bendigo Woollen Mills, colourful, Cotton, crochet, Crochet Missy, easy, Pencil Case, Purse, Stripe. Bookmark the permalink. Often I mess about trying to make a good looking flower. More often then not I fail. 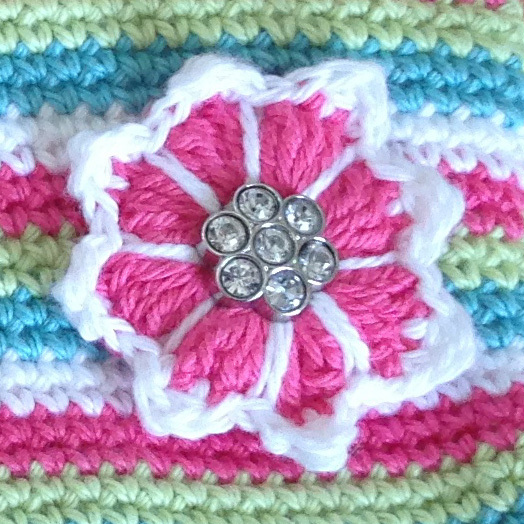 I had scrapped this design because it uses a lot of yarn, but it turned out to have a purpose after all. Your work continues to be wonderful. Thanks for “featuring” my little hound on your blog. Take care. Mark. Your work is amazing so I am happy to help show your pictures in what little way I can. Ooh! Now I’ll have to take up crochet again, ha ha. I am glad to have motivated you to do it. Now I need to get motivated again myself! It certainly eats up time, but it’s such a relaxing hobby. love your work and would love a written pattern for the flowers i absolutely love the pattern cause i often cant find a nice flower as well thanks. Thank you Chanele! It is the only one I have made, it was a bit of an experiment. It has been a long time since I posted to my blog, maybe I should start with this flower. I will have a think and try to remember how I did it. Just know that it used a LOT of yarn, it was very thick.